MIAMI (AP) It’s never been easy for Andrew Wiggins in Miami, and Monday was no exception. 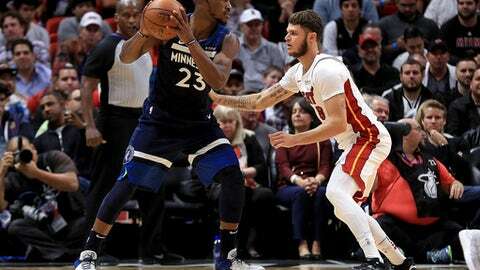 Jeff Teague scored 23 points, Wiggins scored 22 – 13 of them coming after halftime, including a pair of huge baskets late in regulation – and the Minnesota Timberwolves scored the first six points of overtime before holding on to beat the Miami Heat 125-122. ”We have a lot of people who know how to win, know how to close out games,” Wiggins said. Waiters tied a career-high by scoring 33 for Miami, 14 of those coming in the fourth quarter including a layup that sent the game to overtime. But the Heat dropped their third straight – all at home. ”It doesn’t mean (anything) if we don’t get the win,” Waiters said. ”It was great to see,” Heat coach Erik Spoelstra said of the rookie’s stat line, which came against a star in Towns. Wiggins got to the line with 43 seconds left after missing a dunk on a play where Justise Winslow was called for a foul that left the Heat arguing otherwise – but replays suggested was indeed correct. He made both free throws to put Minnesota up by four, and the Heat would eventually get back within one on a 3-pointer by Waiters with 5.1 seconds left. ”There’s a lot of work for us to do defensively,” Timberwolves coach Tom Thibodeau said. Wiggins had both Minnesota baskets in the final 1:01 of regulation, a putback of his own miss and an emphatic dunk for a four-point lead. He’s had some good scoring games against the Heat – at least 22 in four of seven contests – but he’s earned it all. After shooting 7 for 23 Monday, he’s now 46 for 125 (36.8 percent) against the Heat. ”We did things necessary to win at the end,” Thibodeau said.